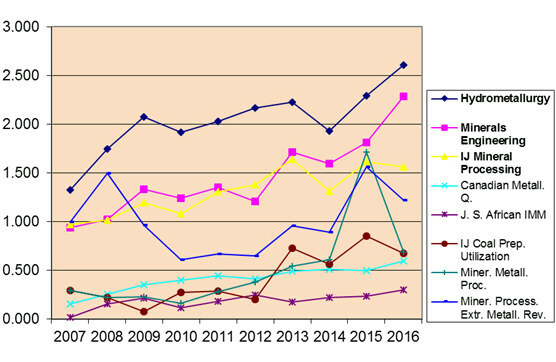 Great to hear this month of the huge rise in the journal's impact factor. The 2016 impact factor is 2.286, a 40% increase on the 2015 figure. 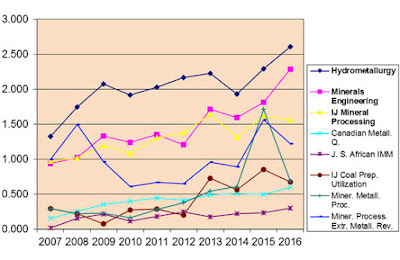 This cements Minerals Engineering's reputation as the leading mineral processing journal, and it is also good to see that the impact factor gap between Minerals Engineering and Elsevier's specialised Hydrometallurgy journal is narrowing. For the past seven years these two journals, as well as International Journal of Mineral Processing, which will be incorporated into Minerals Engineering at the end of the year, have been overseen by Executive Publishing Manager Dean Eastbury, who has become a familiar figure at MEI Conferences. Today Dean officially retires from Elsevier, and will soon be moving from Oxford to Cornwall with his partner Sharlene. We wish them both the very best, and I look forward to joining them for hikes on the South-West coastal path. Dean's position with the journals will be taken by Laney Priestley, who I met for the first time at Computational Modelling '17 earlier this month. Laney will also become a familiar face in our field, and will be with us in Cape Town in November for Flotation '17. Laney is Executive Publisher at Elsevier, currently overseeing a list of mechanics journals, as well as several publications in chemical engineering. She has been with Elsevier for 10 years and her previous roles in the company include Management Trainee and Head of Content Development for Special Issues and Conferences. She studied medicine in Huazhong University of Science and Technology, and holds a Master’s Degree in public health from the Chinese Center for Disease Control and Prevention. I, and the rest of the MEI team, look forward very much to working with Laney and to furthering the reputation of Minerals Engineering as it enters a new era. The Physical Separation conferences, of which Physical Separation '17 was the 5th in the series, are among MEI's smaller conferences, but always attract interesting practical people. This year's event, held from June 15-16 at the St. Michael's Hotel, Falmouth, Cornwall was the biggest in the series, in no small part due to the attraction of two eminent well known keynote speakers, and strong corporate support. I opened the conference this morning, welcoming the 71 delegates from 12 countries to this beautiful part of the world. I then had the pleasant duty of presenting Swadhin Saurabh, of Millcreek Engineering Company, USA, with the 2016 MEI Young Person's Award (posting of 15th June). Sandy Gray, Managing Director of Gekko Systems, Australia, was a finalist this year for the Austmine Champion of Innovation Award. He also received the AusIMM 2017 Professional Excellence Award, and in Denver in February was inducted into International Mining Technology's Hall of Fame. So we were honoured to have Sandy present the first keynote lecture at the conference. As he pointed out, physical separation features in almost every mineral processing circuit. The category encompasses a broad range of techniques and technologies including hydrocyclones, gravity concentration methods (including jigs, spirals, centrifugal concentrators, tables and heavy media separators), and thickeners, all of which make use of the inherent density difference between two mediums. We can also include amongst numerous other technologies, flotation, magnetic separation, and ore sorting in the physical separation category. However, opportunities for enhanced physical separation performance can now go beyond the common practice of optimising unit operation. Improved options exist for feed preparation ahead of the physical separation stage, enabling higher performance and lower cost outcomes for physical separation flowsheets and technologies. The use of new applications in breakage technologies combined with mineral liberation analysis to optimise liberation prior to the physical separation stage provide options for pre-concentration, gangue rejection as well as better separation efficiency. The use of low cost gangue rejection and pre-concentration can be an intermediate step between mining and processing that allows lower cut-off grades in the mine whilst delivering higher grades to the mill. Optimising flowsheets and technology performance requires detailed exploration of particle size, shape as well as liberation to suit the particular separation unit combined with a strong knowledge of the available technologies, their capabilities and economic impact across the whole mining system and lifecycle (more info sandyg@gekkos.com). Tumbling mills, both AG/SAG and Ball are now well accepted to be energy and process inefficient. Rob Morrison, of CRC Ore, Australia, reviewed the development of a new generation of comminution devices which can produce much steeper product size distributions. Combined with precise classification, these devices will produce feeds which are well suited to gravity concentration and should reduce flotation losses at both coarse and fine sizes. They would also potentially be tailored to precision liberation of gangue phases and thus provide a new option to facilitate up front rejection opportunities in the mine ahead of processing (more info r.morrison@uq.edu.au). The efficiency improvement in the comminution of ores has been on the international agenda of the innovative mining industry for some time but substantial advances are still relatively scarce. It is generally agreed that major goals include a substantially reduced energy consumption, systems that operate dry, markedly enhanced particle size reduction, and improved particle liberation. New systems that have been introduced to the market utilise the differential properties of the components within heterogeneous materials such as sulphide ore minerals in silicate or carbonate gangue. These systems use either electrical or mechanical stimulation to create drastically increased stress along particle boundaries that result in breakage, size reduction and thus in the liberation of the commodity minerals. Gregor Borg, of PMS GmbH & Martin Luther University Halle-Wittenberg, Germany, discussed developments in the VeRo Liberator®, which was invented some four years ago and applies a completely new, mechanical comminution principle, which is high-velocity and high-frequency impact comminution. This improved breakage behaviour results in a drastically reduced energy consumption of between 3 and 13 kWh/t, very high degrees of particle liberation, and particle size reduction ratios of up to 6.250 in single pass comminution. Positive side effects of the technique are the embrittlement of ductile (metal) particles, very low noise levels, and a drying effect for moist or wet feed material, allowing for subsequent dry sieving. Gregor claimed that the VeRo Liberator® can either replace several conventional comminution steps or can reduce the application of less (energy) efficient technique to a minimum (more info gregor.borg@geo.uni-halle.de). There was much more on sorting, now an increasingly important technique, in the five papers following the coffee break. Sensor-based automatic ore sorting technologies can be used in the minerals industries to efficiently remove excessive waste and sub-marginal grade material from pre-mined low grade stockpiles, producing a coarse (typically >10mm) upgraded potential plant feed. If upgrading is successful, a supplementary high-margin ore feed can be generated from such stockpiles with minimal capital investment and no requirement for increased mining activity, thereby contributing to increased economic returns to the operations. Kai Bartram, of Steinert, Germany) reviewed the bulk ore sorting testwork undertaken on material from low grade open pit stockpiles at Volcan Compania Minera SAA’s base metals operations in Peru and provided an economic analysis of the potential benefits of ore sorting based on the testwork results and likely operating parameters for a commercial plant (more info bartram@steinert.de). German companies TOMRA and Steinert are the world leaders in the manufacture of electronic sorting machines, and in the next paper, Jens-Michael Bergmann introduced TOMRA´s latest multi-channel laser sorting machine, which opens new opportunities for mining companies. Minerals which could not be differentiated with existing technologies, for instance colour, X-ray transmission, X-ray Fluorescence, Near Infrared or Electromagnetic sensors, can now be identified and separated. The patented new sorter technology uses the scattering effect of multiple lasers inside a detector unit (more info jens-michael.bergmann@tomra.com). Preconcentration consists of the previous discarding of a fraction of the mineral processing plant feed with little or none of the mineral of interest, reducing the mass to be processed in downstream operations (e.g. milling, concentration and dewatering), as well as the capital and operational costs. In this context, Dimas Neto, of the University of São Paulo, Brazil, described an investigation into the performance of density and sensor separation techniques in the removal of the carbonatic gangue of a Brazilian zinc ore, in fraction sizes typical of crusher product, using sink and float tests with heavy liquid, jig stratification and ore sorting with an XRT sensor laboratory scale tests. The best results were in the sink and float in heavy liquid, which indicate the possibility of discarding 30% of the feed mass of the plant, removing over 50% of carbonate, while losing only 2% of the zinc. The ore sorting tests also presented positive results, with an average of 93% metallurgical recovery in 73% of the mass. The results indicate the significant reduction potential of Capex and Opex using preconcentration (more info mbergerman@gmail.com). Jacek Kolacz, of COMEX AS, Norway, reviewed modern sensor-based sorting techniques, focusing on X-ray sorting. He described the construction of the X-ray separator CXR series (Comex X-ray sorting) produced by Comex AS, which uses XRT technology (X-Ray Transmission). There is a thesis that the sorting process using the XRT technology may be an alternative for pre-concentration of Zn-Pb ore, which is usually perfomed by heavy media separation (more info jacek.kolacz@comex-group.com). Sensor-based sorting technology has in fact been around since the 1930s, mainly for high value minerals and metals, food preparation and recycled scrap. It is the recent developments in sensor detectors, together with the higher capacity of the machines, that have made extending the application to the mining industry possible. Jacek Kolacz also presented the results of pilot plant tests carried out on samples of Brazilian iron ore using an x-ray transmission sensor with high selectivity, aimed at the removal of low density particles, and increasing the iron content on the final products, and the early removal of tailings before of run-of-mine milling (more info neymayer.lima@vale.com). Jacques Eksteen of Curtin University, Australia, discussed an assessment of the amenability of gold ores to coarse particle gangue rejection in the pumpable range, characterising and evaluating liberation and separation of gangue from gold-bearing middlings and liberated gold and gold-bearing sulfide particles in the -5 mm size range in general, and more specifically in the -2 mm +0.3 mm size range (as typically generated post tertiary crushing). Liberation patterns produced by various crushing modes (Vertical Shaft Impact (VSI) crushing, Cone crushing, SelFrag® and High Pressure Grinding Roll crushing) were investigated to assess the possibility of preferential and ideal liberation from a particular crusher type for a given ore (more info jacques.eksteen@curtin.edu.au). Steve Walters, of CRC Ore, Australia, described a pilot study demonstrating the physical separation benefits of ROM material through the application of screening. He detailed a pilot trial program comprising three 200kt production blasts. 80kt of ROM material was fed through a mobile screening plant over a three-month period to quantify the physical separation achievable through blasting and screening strategies. The results indicated that 63% more copper could be produced from creating two ROM streams that were processed differently (i.e. dump leach and concentrator). This result was integrated into a system value financial assessment to define the economic potential achievable through coarse separation via screening (more info s.walters@crcore.org.au). Steve Walters was back on the podium after lunch, to introduce Grade Engineering®, an integrated methodology for deploying a range of coarse separation technologies and operational scenarios in hard rock mining operations to deliver value through early gangue rejection and pay element pre-concentration. Within Grade Engineering® five technology ‘levers’ are recognized that drive coarse separation outcomes (>10mm) - natural preferential grade by size deportment, differential blasting for grade; sensor based bulk sorting; sensor based stream sorting; and coarse gravity separation. In order to assess relative techno-economic merits based on applying individual levers or sets of levers for specific ores and operations, it is necessary to define comparative response attributes through a process of physical testing and simulation, much of this work representing ongoing development supported by a consortium of over 30 Miners, Mining Equipment and Technology Suppliers and research providers (more info s.walters@crcore.org.au). With depleting iron reserves and difficult market conditions, precision in separation efficiency is of utmost importance for all separation related equipment in processing plants. Classical local control options are predominant in the industry, but their inability to quickly adjust to varying operational inputs has necessitated the need of developing and implementing continuous control methodologies. High gradient magnetic separation (HGMS) is an important technique in iron ore processing and Riddhika Jain, of Ouotec Inc., USA, highlighted the recent automation development for the Outotec SLon VPHGMS, showing how these modern control options result in improved separation efficiencies, promote safer operations and reduce operational expenses from maintenance and manpower (more info riddhika.jain@outotec.com). HGMS is a key method in the concentration of ilmenite ores, and Luzheng Chen, of Kunming University of Science and Technology, China, discussed the processing of ilmenite tailings from Panzhihua ilmenite reserve in Chinese Sichuan province; this reserve accounts for more than 90% of the titanium resource of China and over 35% of the world. Until recently, however, the recovery has been just slightly over 20% with the pulsating HGMS-flotation technology which is widely applied in China. In recent years HGMS in a centrifugal field has been investigated, which produces a high selectivity for ilmenite and significantly improves the TiO2 grade fed to cleaning by flotation, and benefits to the enhanced separation of ilmenite from the tailings (more info chluzheng@kmust.edu.cn). A new approach in modelling the magnetic separation of Ta and W ores, conducted on a laboratory wet high intensity magnetic separator (WHIMS), was described by Filipp Zolotarev, of the Institute of Mineral Processing Machines, Germany. Using a fundamental approach based on mineral composition and susceptibility measurements of a gravity concentrate from a European Ta deposit, the influence of particle size, field intensity, solid content and other parameters on recovery and separation quality were investigated. The aim of the work is to implement recognized dependencies of recovery and separation quality on the parameters determined in experimental tests in a simulation model. The empirical model was presented and compared with models commonly used in the industry, conclusions being drawn for more efficient operation of WHIMS in industrial applications with real-time process control (more info holger.lieberwirth@iam.tu-freiberg.de). Electrostatic separation is an important preconcentration technique utilized in the beneficiation of monazite. As part of a feasibility study being undertaken at the University of South Australia to separate rare earth element minerals from selected low grade ores found in South Australia, George Abaka-Wood described an extensive laboratory investigation carried out on model mixtures. Most of the rare earth elements deposits in South Australia are associated with hematite and quartz minerals, hence mixtures of monazite, hematite, and, quartz were used. The purpose of the investigation was to determine the optimum separation conditions for concentrating monazite from model mixtures using electrostatic separation. The influence of electric field intensity, radial distance, and particle size distribution on separation efficiency were investigated. The results obtained are consistent with the electrical properties of the minerals used, showing that preconcentration by means of electrostatic separation is feasible for attaining significant monazite upgrade, with selectivity being particle size dependent (more info george.abaka-wood@mymail.unisa.edu.au). Lewis Baker, of ST Equipment & Technology LLC, USA, showed how the STET tribo-electrostatic belt separator provides the mineral processing industry with a means to beneficiate fine materials with an entirely dry technology. The triboelectric belt separator technology has been used to separate a wide range of materials including calcite/quartz, talc/magnesite, carbon/silicates and barite/quartz. Lewis claimed that the enhanced separation capabilities of the STET system may be a very effective alternative to flotation processes. An economic comparison conducted by an independent mineral processing consulting firm of the tribo-electrostatic belt separator versus conventional flotation for barite / quartz separation illustrates the advantages of dry processing for minerals, with significantly lower capital and operating expenses, and a greatly simplified process flow sheet. Following successful commissioning of an STET barite processing facility in India, performance data was presented to illustrate the effectiveness of STET’s technology implementation (more info lbaker@titanamerica.com). The weather in Falmouth has been glorious all week, and shortly after final coffee, I took most of the delegates on our usual 3 and a half mile coastal path walk into old Falmouth, for welcome drinks by the inner harbour at the award-winning real ale pub, The 'Front, kindly sponsored by Grinding Solutions Ltd (see also posting of 15th June). Physical Separation ’17 is a direct descendent of the 1st Gravity Concentration Conference, which was held at the Camborne School of Mines in 1990. The keynote speaker at that conference was Tim Napier-Munn, of the JKMRC, Australia, who gave a progress report on the modelling and simulation of dense medium separation processes (Minerals Engineering Volume 4 nos. 3-4, 1991). Tim became Director of the JKMRC in 1997, and, now semi-retired, it was great to have him back in Cornwall to present the 2nd keynote lecture of the conference, appropriately on the past, present and future of the dense medium cyclone (DMC). Since the dense medium cyclone was first patented in the 1940s it has become the process of choice in coal preparation, and is also widely used for upgrading iron ore and in the pre-concentration of diamonds and metalliferous and industrial minerals. It is in every sense a mature technology. Tim summarised the history of the process, and considered its current status in mineral and coal processing, suggesting ways in which the process might evolve. Particular attention was given to the potential for the use of larger cyclones at lower heads in mineral separations, as practiced in the coal industry. Using operating data and simulation models, he suggested that these conditions will work in minerals too, and should be adopted, as this will significantly improve the economics of DMC mineral separations at a time when pre-concentration is becoming more important for upgrading lower grade ores (more info t.napier-munn@uq.edu.au). Density tracers are often used to identify the separation efficiency of the mineral processing equipment and overall plant performance in several mineral and coal applications. Damla Izerdem, of Hacettepe University, Turkey, described a plant audit in a 700 tph Turkish coal washing plant, comprising dense medium drums and dense medium cyclones, using density tracers. Besides the detailed separation behavior of the particles in drums and cyclones, some variables affecting the performance such as particle retention, cut-point and separation efficiency were also discussed (more info damlagucbilmez@hacettepe.edu.tr). David Powell, of Mintek, South Africa, described a pilot test campaign to evaluate DMS cyclone separation efficiencies on samples of iron ore fines (-1mm +300µm) using both gas and water atomised FeSi types across a range of operating conditions in the presence of slimes build-up. A Mineral Liberation Analyser (MLA) was used to measure size, density, shape and liberation data of DMS feed and products. The results of the test work were used to obtain parameters for modelling of the partition size/density response. The findings indicated that accurate density characterisation of the feed ore is essential in understanding product quality and recovery, particularly due to the effect of porosity and micro-inclusions. The presence of slimes and control of rheology in the FeSi media was demonstrated to be essential in obtaining efficient separation (more info carlb@mintek.co.za). Taking us to the coffee break, Jong-Leng Liow, of the University of New South Wales, Australia, discussed the performance of mini-axial hydrocyclones, which have been much less studied than the reversed flow hydrocyclones but can be a viable alternative by providing lower pressure drop losses for the same Reynolds number (more info j.liow@adfa.edu.au). Following the break, Dennis Vega, of Imperial College, UK, discussed the optimisation of small hydrocyclones for fine particle classification. The processing of fine (minus 20 µm) ore presents many challenges. Small diameter (10 mm) hydrocyclones have been applied successfully for particle classification in the micro size range due to the fact that their diameter is in direct relation to the particle cutsize that can be achieved. The design of these units, however, has not been fully explored. Testwork has shown that the dimensions of small hydrocyclone units (spigot diameter, vortex finder diameter) can be effectively manipulated to enhance separation performance, the results providing a more complete understanding of design effects in small hydrocyclones than achieved to date (more info p.brito-parada@imperial.ac.uk). Ozgur Ozcan, of Hacettepe University, Turkey, compared classification techniques such as hydrocyclones and the teetered bed separator for their size separation performance. The results of plant and laboratory studies were then used to improve the performance of a conventional closed circuit grinding plant, producing the raw material required for the production of Autoclave aerated concrete in Turkey (more info ozgurozcan@hacettepe.edu.tr). In order to investigate the impact of density on the classification behaviour of particles in the static classifier in a Vertical Spindle Mill, Hong Li, of China University of Mining & Technology, showed how narrowly sized pyrite, carborundum, quartz and coal samples were classified at different air flow rates by a lab-scale classifier. Size-by-size efficiency comparison demonstrated that particles with higher density have lower classification efficiency at a certain air flow rate, and based on the Whiten’s model, a new classification efficiency model with the addition of particle density in various forms was established to reevaluate the efficiency of materials with different density in the identical experiment conditions (more info yqhe_cumt@126.com). At present accurate determination of fine screen performance is best done by means of conducting full scale screening tests with representative sample material. By its nature, full scale test work can be quite resource intensive. Elizma Ford, of Mintek, South Africa, presented a test work approach that can efficiently provide a suitable number of experimental data points to model the partition function of a given screen over a wide range of feed conditions. She showed how this approach can offer benefits to metallurgists involved with screening circuit design and operation of industrial screening circuits (more info ElizmaH@mintek.co.za). The IHC jig was developed to process feed from alluvial deposits to recover gold or tin. Extensive tests have been conducted in the past and these have led to the current knowledge base of the IHC jig. When the material fed to the jig changes drastically, this knowledge is challenged. As the circular economy is strongly promoted by governments, more man-made materials must be treated in order to recover valuable materials and metals for re-use, this driving the need for efficient and clean separation methods. In the recycling industry gravity separation is often considered, as it does involve materials with different densities and does not require chemical additives. Gravity separation has to be adapted to these new materials, as material characteristics differ and their influence on the separation process in the jig sets new challenges to the equipment design. Taco de Boer, of IHC Mining, The Netherlands, discussed design requirements and the steps undertaken to adapt the IHC jig accordingly (more info t.deboer@royalihc.com . Martin Brandauer, of Karlsruhe Institute of Technology, Germany, was first on after lunch to discuss the treatment of radioactive waste from abrasive water jet cutting. The cutting of activated components in the decommissioning of nuclear facilities with abrasive water jet cutting results in a mixture of abrasive particles and radioactive steel chips. With the help of a magnet rod filter, treatment of this waste is being pursued in order to allow the treatment of the used abrasive constituting the major part of the mixture (more info martin.brandauer@kit.edu). The Nechalacho deposit, located in the Northwest Territories, Canada, is a heavy rare earth element (REE) deposit. Of the various REE-bearing minerals in the deposit, zircon is of significant importance, due to its elevated heavy rare earth element (HREE) content. Most studies performed on this ore to date have focused on fully liberating REE-bearing minerals through fine grinding (-53 micron) prior to a separation stage, however, previous lab scale work has shown that zircon is concentrated in relatively coarse sizes following shorter grinds. The current work, described by Chris Marion, of McGill University, Canada, investigated the pre-concentration of zircon by selective comminution followed by a gravity separation stage of the enriched coarse feed. From the grind study, it was determined that the optimum particle size distribution for upgrading zircon in coarse fractions occurred at 80 % passing 106 micron, with significant upgrading observed in the +53 micron fraction. This fraction was subsequently processed by dense media separation, a spiral and a Knelson Concentrator to determine if further upgrading can be achieved (more info kristian.waters@mcgill.ca). Monazite which is a phosphate mineral commonly containing rare earth elements (typically lanthanum, cerium, and neodymium), occurs in association with hematite and quartz gangue minerals in some South Australian ores. In an investigation carried out at the University of South Australia, descibed by George Abaka-Wood, the feasibility of exploiting the differences in specific gravity to concentrate monazite from hematite and quartz minerals mixture was studied. A Knelson concentrator was used to determine the influence of feed mass (50 – 300 g), operating water pressure (1.5 – 4.5 psi) and bowl rotation speed (40 – 70 Hz) on beneficiation of monazite from model mineral mixtures. The findings demonstrate that multi-gravity separation may be used to concentrate monazite mineral from low grade lateritic ores where complete liberation of constituent minerals have been achieved. The concentrate generated may further be purified to enhance monazite upgrade via magnetic separation or froth flotation (more info george.abaka-wood@mymail.unisa.edu.au). Rob Fitzpatrick, of Camborne School of Mines, UK, used a Mozley Multi-Gravity Separator (MGS) to promote recovery of fine tungsten-bearing minerals from a waste stream from a European tungsten mine. The mine produces a magnetic waste stream from a low-intensity magnetic separator which has been found to contain approximately 20%WO3. Quantitative mineralogical analyses of this stream have shown that the tungsten is mostly contained within ferberite (FeWO4) which is well liberated from hematite, the main gangue mineral in the magnetic stream. The ferberite exhibits varying degrees of weathering and alteration. Further analysis using an electron microprobe has shown that the weathering is associated with a decrease in the tungsten content in the mineral structure resulting in a range of Fe:W ratios. Mineralogical analysis suggested that it should be possible to recover liberated, unweathered (tungsten rich) ferberite from this waste stream by using the MGS to exploit the difference in density. Under optimal conditions it was predicted that 40% of the tungsten could be recovered above the required grade of 43%WO3 (more info r.s.fitzpatrick@ex.ac.uk). McGill University's Chris Marion was back on the podium for the final presentation of the conference. He discussed the challenges faced as mineral deposits become increasingly more finely disseminated. Fine grinding, required for liberation, creates many challenges when trying to treat these ores, and many separation techniques become ineffective. Gravity separation techniques traditionally require relatively coarse material to effectively concentrate valuables, however, the development of centrifugal gravity separators, such as the Knelson Concentrator, has allowed for the processing of much finer material. While the Knelson Concentrator is well established for treating gold ores, due to its relatively low cost and small environmental impact when compared to other separation techniques, it has become an active area of research for the processing of low-density deposits. Chris described an investigation to determine the optimum operating conditions when processing fine (-38 micron) low-density material using a laboratory 3-in Knelson Concentrator (more info kristian.waters@mcgill.ca). MEI's Amanda Wills closed the conference, inviting everyone to attend Physical Separation '19, which will be held in Cape Town in April 2019. Then after a final cream tea in the hotel gardens, I gave a brief introduction to Cornwall's copper and tin mining heritage, after which we travelled the 12 miles to the heart of the historic Camborne-Redruth area, for a leisurely 2 mile stroll around the now severely overgrown ruins of the 19th and early 20th century Basset mines, which finally closed in 1918 (see also posting of 16th June). Draft papers presented at the conference are available from MEI Online. 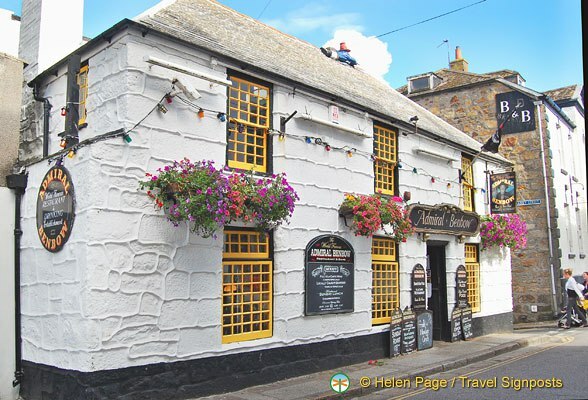 The Admiral Benbow in Penzance is a unique pub and restaurant with a worldwide reputation and a famous history, having been in existence since the 17th century. Robert Louis Stevenson's 1883 novel Treasure Island opens at the Admiral Benbow, the inn owned by the father of Jim Hawkins, whose quest for buried treasure provides the tale of adventure. The interior of the pub now houses a fascinating collection of maritime artefacts rescued from numerous shipwrecked vessels which foundered on the Cornish coast during the last 400 years. Last night the Admiral Benbow was the venue for the June Cornish Mining Sundowner, unfortunately attended by only six people, in no small part due to the extremely heavy traffic flowing down to this remote area of Cornwall. I travelled by train from Falmouth, and met up with ex-Camborne SOM geology lecturer Richard Edwards (see also posting of 18 March 2016) at Truro station. Richard was on a flying visit to Cornwall and was keen to make his debut at a sundowner. Making their second appearance at the sundowners, having only recently moved to Cornwall, were Alan Matthews and his wife Linda. Alan graduated from Camborne SOM in 1974, and Richard was one of his geology lecturers, so a few anecdotes were swapped in their first reunion in 43 years! Richard recalled delivering what he thought was one of his most inspiring lectures, only to spot Alan fast asleep at the back of the class! Making up the six were three mineral processors, Bentley Orchard, Tony Clarke and me. Bentley, formerly with FLSmidth and Weir Minerals, is now fully retired, and happy singing in a Cornish male voice choir. Tony, my old colleague at Camborne, I now regard as the leading historian on Cornish mining, and the man I always turn to if I need any information on our wonderful mining heritage. So a very small turnout last night in the far south west of Cornwall, but a very interesting one. The conferences in MEI's Computational Modelling series are the smallest, but most specialised of all our events, and attract a core of researchers working in this cutting edge field. Computational Modelling '17, the sixth in the series, was held at the St. Michael's Hotel, Falmouth, UK, from June 13-14, and below is my short report on the event, which I hope captures the flavour of the two days. The conference was opened this morning by MEI's Jon Wills, who introduced the 33 delegates from 12 countries to beautiful Falmouth and Cornwall, after which Stephen Neethling, of Imperial College, UK, set the scene for the conference with his keynote lecture on the modelling of multi-phase minerals processing systems. Minerals processing is characterised by complex multi-phase flows that present significant modelling and simulation challenges. Recent advances in not just computational power, but also the models, algorithms and implementations, especially in terms of parallel processing, have resulted in significant improvements in our ability to directly simulate these systems. Despite the computational resources available, the shear range of scales at which important phenomena occur at in minerals processing means that no one technique can hope to resolve all the complexity of these systems. This means that the approach used needs to be tailored to the system and scale being studied, and Stephen examined a range of different approaches that have been applied within the Imperial College group (more info: s.neethling@imperial.ac.uk). In his paper "Decoupling the impact of rock properties and operational settings on minerals processing performance: a data-driven approach", Suriadi Suriadi of the Queensland University of Technology, Australia showed that mining operations record a large amount of data from multiple sources (e.g. block model, online processing information) which, currently, is neither effectively nor systematically used to understand and improve operational performance. He proposed a generic semi-automatable data analytics method, the Integrated Analysis Method (IAM) which addresses the disconnection between disparate datasets. IAM enables evidence-based understanding of rock and machine parameters, laying the foundation for a more sophisticated way to model and predict mining processes to deliver financial value (more info: s.suriadi@qut.edu.au). Adrian Hinde is a well known face at MEI Conferences. Formerly with Mintek, South Africa, he is now an independent consultant. He discussed how, in mining operations, comminution or size reduction usually begins with the use of explosives to generate a run-of-mine product suitable for transport to the metallurgical plant. At the plant, the ore is crushed and milled in stages to liberate and concentrate the valuable mineral species. As a result of laboratory and pilot scale comminution tests it is possible to develop mathematical models of comminution equipment to guide the design, control and optimisation of production scale circuits. Data from these tests can be subject to significant levels of experimental error. Adrian looked at the application of statistical resampling techniques to estimate model parameters and their confidence limits, irrespective of whether the models are linear or nonlinear in structure. Consideration was also given to the application of these techniques for reconciling mass balances around comminution circuits with recycle streams (more info: adrianh@icon.co.za). Following the coffee break Yuande Zhou, of Tsinghua University, China, asked what can we learn from single spherical particle breakage. The role of single particle breakage has been recognized to be of great significance in many industrial practices as well as in geotechnical and geological events. Many types of single particle breakage test methods have been proposed in the literature and widely used to determine the comminution characteristics of ore particles, such as the twin pendulum test, the JK drop weight test, and the short impact load cell test. Considering the randomness and heterogeneity of ore particles, the breakage distribution function has been more widely adopted for describing the size distribution after crushing or grinding from a statistical aspect. Yuande presented an investigation into the breakage performance of single spherical particle under quasi-static platen compression (more info zhouyd@tsinghua.edu.cn). Vertically stirred mills are widely used for comminution in wet and dry conditions in numerous industrial applications. This type of mill has lower specific energy consumption (kWh/t) compared with the ball mill and part of this efficiency is due to the spectrum of energy involved in grinding media movement. The vertical mill does not waste energy with the lifting of balls, for example, and imposes impacts of lesser magnitude and greater frequency of collisions with the grinding media. Douglas Mazzinghy of the Universidade Federal de Minas Gerais, Brazil, discussed numerical analysis of vertical stirred mills scale-up using the discrete element method to obtain the spectrum of energy of the grinding media for vertical mill and ball mills (more info dmazzinghy@demin.ufmg.br). Domenico Daraio, of Johnson Matthey Technology Centre, UK also discussed attritor mill- grinding media dynamics, showing how a full understanding of both media motion and medial ball-impeller-grinding chamber interactions are the key features to improve performance and/or product quality. He presented results of a study using the DEM modelling to provide information on the grinding media dynamics and the state of stress inside an attritor mill when changing impeller designs (more info domenico.daraio@matthey.com). Elizma Ford, of Mintek, South Africa, also used DEM in experimental testing conducted in a batch stirred mill, to investigate the effect of bead size and stirrer speed on product particle size (more info elizmaf@mintek.co.za). Following the lunch break, Luis Cisternas, of Universidad de Antofagasta, Chile, discussed how the use of simulation in milling operations is a difficult task because there are uncertainties in operation conditions and mill model parameters, no papers having been published in the literature that propose how to consider these uncertainties. He showed that uncertainty analysis (UA) and global sensitivity analysis (GSA) can be useful tools in the identification of operational conditions for mill systems under uncertainties. A semi-autogenous grinding was used to explain the procedure, UA being used to study the effect of distribution and magnitude of the uncertainties of the input variables on the responses of the grinding process and control of the uncertainty of the significant input variables allowing control of the uncertainty in output variables (more info luis.cisternas@uantof.cl). This was followed by two papers from Luleå University of Technology, Sweden. Par Jonsén said that modelling of wet grinding in a tumbling mill is an interesting challenge. A key factor is that the pulp fluid and its simultaneous interactions with both the charge and the mill structure have to be handled in a computationally efficient approach. He showed how the pulp fluids can be modelled with a Lagrange based method called incompressible computational fluid dynamics (ICFD) that gives opportunity to model free surface flow (more info par.jonsen@ltu.se). In the second Luleå paper, Simon Larsson discussed an experimental and numerical study of granular flow using particle methods, and the application in handling of potassium chloride. He showed how advanced optical measurements using digital speckle photography were utilised to obtain the flow characteristics and to support the development of a numerical model of the material flow (more info simon.larsson@ltu.se). As explained by Christian Ihle, of the University of Chile, slurry pipelines transporting a coarse –the comminution product– and a fine fraction, both in the presence of seawater, can cause an alteration of the liquid phase chemical composition, and he presented results of work on numerical simulation of cation exchange in fine-coarse seawater slurry pipeline flow (more info cihle@ing.uchile.cl). In the final paper of the day, Chenwen Wang, of Lanzhou University, China, discussed the removal efficiency of industrial particles resulting from aggregation with different amounts of water vapour in a cyclone separator, demonstrating that improving wetting, and choosing the appropriate humidity conditions, in agglomeration and collection could be an effective way to collect ultrafine dust from industry (more info wangchw16@lzu.edu.cn). We are enjoying glorious weather in Falmouth, ideal conditions for delegates to unwind at the end of the day, for the 3 and a half miles coastal walk to the Quayside Inn in old Falmouth, led by Jon (see also posting of 13th June). Screening is one of the most widely used unit operations in mineral processing plants. In crushing circuits, the proper selection and sizing, optimization and their operation as efficient as possible is essential in terms of the performance and profitability of crushing circuit and the whole plant. Ahad Harzanagh of Hacettepe University, Turkey, discussed the effects of various design and operating variables on the efficiency of screening, investigated by means of DEM simulation of industrial vibrating screens (more info ahad.aghlmandi@gmail.com). Wet high intensity magnetic separators (WHIMS) are used in magnetic separation of minerals with low susceptibility. The dynamic process of material built-up in the matrix is influenced, among others, by the matrix geometry, gradient and strength of the magnetic field. These factors, however, do change with the built-up of magnetic material in the matrix. Detecting the built-up of magnetic material is crucial to the continuous operation of WHIMS. Raheel Rasool of the Institute of Mineral Processing Machines, Germany, presented a numerical modelling approach for WHIMS. The electro-magnetic and the fluid flow field are modelled with the FEM, while the material particles are identified and evolved using the Level-set approach. Such a framework retains the influence of magnetic particles on the surrounding magnetic field and can be used to detect and predict material build-up in the matrix (more info holger.lieberwirth@iam.tu-freiberg.de). Jiangang Ku, of Fuzhou University, China, studied the magnetic flux density distribution of particles based on finite element analysis, to produce a simplified model for calculating the magnetic induction field (MIF) of an irregular magnetic particle. The results show that sphericity is the key factor affecting the MIF of an irregular particle, the calculated value of the MIF distribution using the particle volume radius becoming more accurate the higher the sphericity (more info kkcc22@163.com). Luis Cisternas of Universidad de Antofagasta, Chile, presented what he said was a comprehensive review of all significant research applying computational optimization to flotation design problems. Specifically, the optimization algorithms, superstructures utilized, objective functions, cell and bank models, and the incorporation of uncertainty were considered, and the new knowledge generated using these techniques was highlighted (more info luis.cisternas@uantof.cl). More on flotation after the coffee-break, with Pablo Brito-Parada, of Imperial College, UK, presenting a three-dimensional numerical framework for the modelling of the pulp phase in froth flotation. It is important to understand the dynamics of the turbulent three-phase flow in the pulp phase to design efficient flotation tanks. Computational fluid dynamics (CFD) has been used in the past for simulating the hydrodynamics of the pulp phase and flotation rate estimates have been calculated using these models for simple flotation cell geometries. However, the aforementioned simulations have made use of commercially available codes, which provide limited tractability, and have often considered multiphase models that are limited to monosized bubbles and/or particles. To address these limitations, the group at Imperial has implemented polydispersed flow models in an open-source finite element code called Fluidity (more info gaurav.bhutani@gmail.com). The morning session finished with five papers on pyrometallurgy. Par Jonsén, of Luleå University of Technology, Sweden, discussed the numerical prediction of fracture in iron ore pellets during handling and transportation (more info par.jonsen@ltu.se). Chris Pickles, of Queen's University, Canada discussed advances in the modelling of pyrometallurgical processes. Pyrometallurgical processes tend to operate at relatively high temperatures and thus equilibrium is usually approached. Modelling is an attractive alternative to performing both costly and time consuming pyrometallurgical experiments, and Chris reviewed some of the software available and its application to pyrometallurgical processes (more info christopher.pickles@queensu.ca). The refractory linings used in smelting furnaces undergo cooling and heat-up cycles when the furnaces are shut down and restarted. Herman Kotze, of the University of Pretoria, South Africa, described the development of a 3D finite element model of a DC smelting furnace, to reach an improved understanding of furnace refractory linings under transient thermal and mechanical loads (more info ah.kotze@gmail.com). Mineral industries require effective processes of both combustion and mineral transformation. Mostly, general purpose computational fluid dynamics (CFD) models are inadequate and interactive combustion and mineralization calculations are essential in reasonably predicting the gas species, temperature and flow fields as well as emissions and calcination/transformation levels of the minerals. Michalis Akritopoulos, of CINAR Ltd, UK) discussed modelling and experimental results from a Parallel Flow Regenerative Kiln (PFRK). The PFRK kilns are considered the most energy efficient in the lime industry and exhibit energy efficiency of about 85% in most cases (more info tahir@cinar.co.uk). Rotary kilns are used in several minerals processing operations, as well as related industries such as cement manufacture. They have been found to be ideal for some roasting and calcining processes, as well as some other operations such as nodulization. Examples are alumina calcining, the ilmenite reduction stage of the Becher process, iron ore reduction, and pet coke calcination. Taking us to the lunch-break, Philip Schwarz, of CSIRO Mineral Resources, Australia, described a hybrid simulation methodology for rotary kilns including granular flow and heat transfer (more info phil.Schwarz@csiro.au). Hydrometallurgy was the theme of the afternoon, and final, session of the conference. Matti Lampinen, of Lappeenranta University of Technology, Finland, stressed that hydrometallurgical reactor leaching is a multiphase reaction system, and research and development of reactor leaching faces many of the challenges typically found with such systems. In view of the complexity of the task, the use of sophisticated modeling and simulation tools is a valid approach for analysis of the important phenomena behind the leaching process, their interactions and relative importance. Matti presented modelling and simulation work that provides good premises for the development of leaching reactors, based on atmospheric direct leaching of zinc concentrates (more info: matti.lampinen@lut.fi). Heap leaching is a major recovery method for extracting metal from low grade ores. Due to the long leach cycles and solution residence times it is desirable to simulate these systems for both control and optimisation purposes as the impact of an operational change on the performance is very slow. Due to the wide range of length scales involved, the effect of micro-scale mineralogical and textural properties have to be approximated and parametrised when modelling at the heap scale. Normally this is calibrated using experimental data obtained from time-consuming leaching experiments. Francisco Reyes, of Imperial College, UK, showed that by combining X-ray micro-computed-tomography (XMT) and an appropriate simulation environment, leaching rate kinetics can be assessed in a more comprehensive and time efficient way (more info f.reyes-leiva14@imperial.ac.uk). In the final paper, Janco Strydom, of Stellenbosch University, South Africa, described the simulation of a high-pressure base metal leaching operation, including control layers and abnormal event detection. The critical control layers included sensors, actuators, regulatory controllers, alarm systems, safety interlocks and supervisory control. With the help of expert knowledge, a fault (abnormal event) library was incorporated into the dynamic model. With the use of this dynamic process model, fault detection and identification techniques can be more accurately evaluated for hydrometallurgical industry use. Furthermore, with the use of economic performance functions, an economic case can be made for the use of process monitoring in industry (more info lauret@sun.ac.za). MEI's Amanda Wills closed the conference, and invited delegates to attend Computational Modelling '19, which is planned to be held in April 2019 in Cape Town, where the series began back in 2005. Draft papers presented at the conference are available from MEI Online, and authors have been invited to submit final papers for peer-review to a special Computational Modelling issue of Minerals Engineering. Physical Separation '17 finished today with my brief introduction to Cornwall's copper and tin mining heritage. We then travelled the 12 miles to the heart of the historic Camborne-Redruth area, for a leisurely 2 mile stroll around the now severely overgrown ruins of the 19th and early 20th century Basset mines, which finally closed in 1918 (see also posting of 3rd June). Chatting in a concave buddle!